If you crave for grilled food, a serving of perfectly seasoned fish is your best bet. I'm a big fan of grilling whole fish with skin intact. The advantage is enhanced flavor and no fear of fish getting disintegrated. 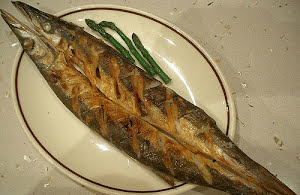 The following grilled pike recipe has a strong garlic flavor which can be moderated as per your preferences. But, if you still prefer a fillet, feel free to go ahead with that. These grilled pikes should be served with fluffy rice and with a bowl of salad. If you're not too calorie conscious, you can use liberal quantity of butter to add more kick to the grilled fish. Though charcoal fire is the way to go, the regular electric grill will do the job. It's time to quickly make this grilled pike with select flavoring ingredients. Savor this delicious, soft, and mouthwatering grilled pike preparation which is strongly flavored with garlic for an irresistible aroma and a unique flavor. Rinse and pat dry all the pikes. Through a sharp knife, cut each pike into two equal pieces from the center. Make criss-cross cuts on the skin of both the pieces. Rub generous quantity of sea salt both inside out on each of the pieces and keep aside. Take a bowl and add half a cup of extra virgin olive oil in it. Add garlic paste, white pepper powder, light soy sauce, oyster sauce, and sesame oil in the bowl. Whip briskly to combine everything well. Apply this marinade both inside out on each of the pieces. Set grill on a medium-high temperature. Grill each marinated pike piece for about 10 minutes flipping once in between.